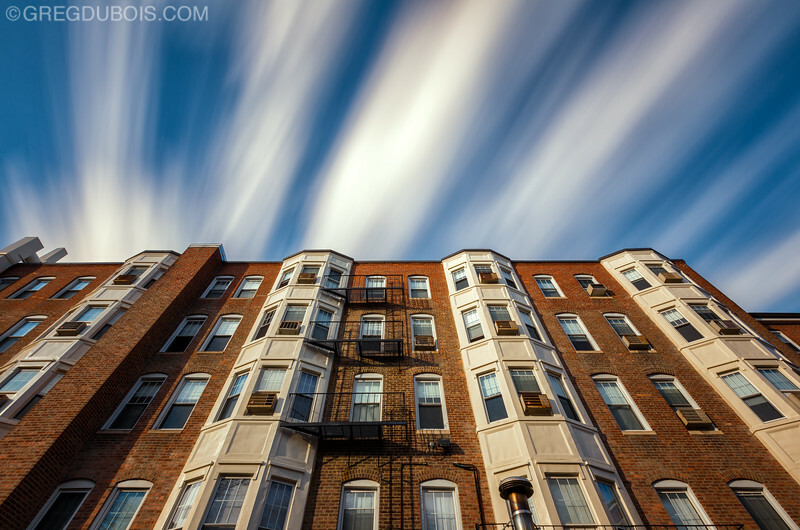 I had seen this building from the front on Beacon Street and thought it would be cool to try a shot there. The front resembles an English Tudor manor house with battlements, and is inspired by the next door neighbor Richmond Court. It was built in 1900 and was formerly the Brookline Motor Hotel. The clouds were looking good today so I cruised down to check it out, but the lighting wasn't great from the front, so I walked around the back hoping there was something to work with. It looked pretty cool and the light was great so I went with it, although a far different look. I had to set up behind a car so I kept my fingers crossed the owner wouldn't want to leave. I then proceeded to wait 75 mins in below freezing weather to get this batch of clouds that covered the entire frame with nice spacing, needless to say I was relieved to get a decent cloud batch for my troubles.